Whether or not you call it pop or soda, one thing is certain. 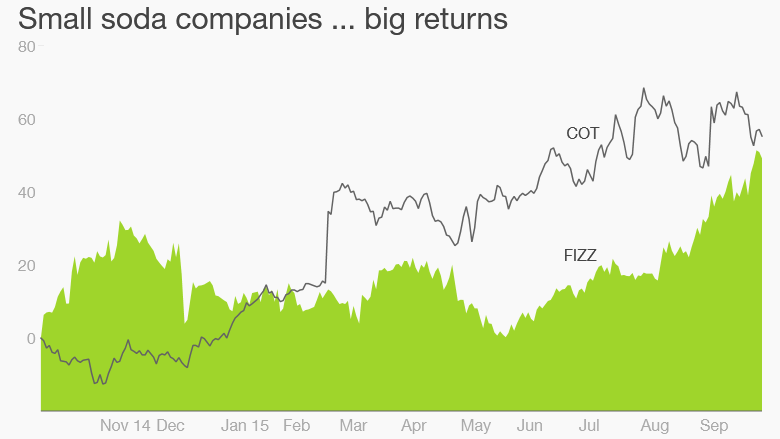 The business of carbonated beverages is not one of Wall Street's favorites this year. Shares of Pepsi (PEP) are like a bottle that's been left in the fridge with its cap off for too long -- flat. Coke (KO) has fallen 5%. Companies that let you make your own soda at home have lost their caffeine buzz and sugar rush as well. SodaStream (SODA), the company that sells do-it-yourself carbonated beverage makers, has plunged more than 30%. The only big soda company doing well is Dr Pepper Snapple (DPS). Its stock is up 10%. Related: Is Keurig's Kold worth the price? So you might be surprised to learn that two small soda companies are actually thriving in this rocky stock market. You've probably never heard of National Beverage (FIZZ). The company is worth just $1.4 billion, making it a tiny bubble in the market compared to Coke and Pepsi. But the stock, which has the awesome ticker symbol of FIZZ, is up 33% this year and near an all-time high thanks to the popularity of some brands with passionate followers. And Thrillist even put out a "14 Things You Didn't Know About Shasta Soda" article earlier this year. Some of the revelations? George Costanza drank it on an episode of "Seinfeld." And The Beastie Boys (naturally) name dropped it in a song. National Beverage owns two other popular brands as well, Faygo -- which is huge in Michigan -- and sparkling water maker LaCroix. Both of those brands have a devoted following on social media too. The Faygo Facebook page has over 120,000 likes, while the LaCroix Facebook page has over 200,000 likes. LaCroix also has 21,000 Instagram followers, more than three times that of Coke's Dasani water brand. Shasta, Faygo and LaCroix have been a winning recipe for National Beverage. The company's sales were up 6% in its most recent quarter. Coke and Pepsi both reported a decline in revenue in their second quarter, as the strong dollar hurt their foreign sales. And over the past five years, National Beverage's earnings have increased by an average of 8%. Coke's profits have grown less than 1% annually during that time frame while Pepsi's were up just 1.8% a year. So National Beverage's financials and stock price have more fizz than Coke and Pepsi. 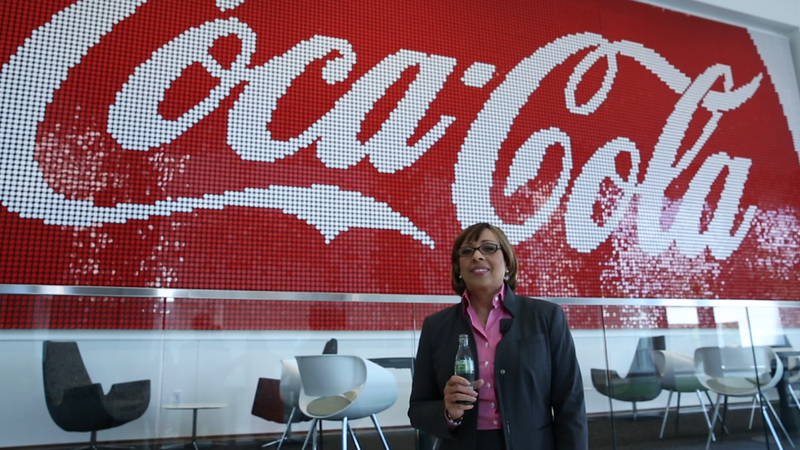 But there's actually another small cola company that's done even better this year: Cott. Shares of Cott (COT) are up more than 55% so far in 2015. Cott makes private-label sodas for supermarkets and convenience stores. If you've ever had Vess or Stars and Stripes, you have Cott to thank. But Cott's biggest customer by far is Walmart (WMT). Cott makes private label sodas for Walmart with names that sound suspiciously like more popular brands, such as Sam's Mountain Lightning and Dr. Thunder. More than a quarter of Cott's revenues last year came from Walmart. Walmart has been struggling lately though. And Cott seems to realize that. It's diversified with the recent acquisition of a company called DS Services, which delivers bottled water and coffee to offices. Cott doesn't have the hipster appeal that National Beverage does with its quirky brands. But its earnings are expected to soar 60% next year. The fact that both stocks have done much better than Coke and Pepsi this year show that investors shouldn't always assume that bigger is better. Sometimes, there's more value to be found in smaller, niche players than with the industry's titans.